Trapiche emeralds are very rare, and when colour and clarity are good, this feature puts them into the most desirable class of gemstones. We had an opportunity to examine a suite of four such Trapiche Emeralds (figure 1), said to be cut from a single crystal, courtesy Birla Enterprises. The spoke-like 'rays' emanating from a hexagonal centre gave an appearance of a fixed six- rayed star and the cores may be green, white, colourless or black. Figure 1: A suite of four trapiche emeralds, total weight 40.82 ct with the largest heart-shaped cabochon weighing 17.65 ct. The term ‘trapiche’ in Spanish is used to describe the cog-wheels (spoked) used to crush sugarcane (Sinkankas, 1989) and hence the description for such gemstones. These rays resemble those resulting from asterism, but they remain stable in their positions in the crystal when either the crystal or the light source is moved. The trapiche structure is caused by black carbonaceous impurities (Sinkankas, 1989). The total weight of the examined suite of four such specimens was 40.82 carats; the largest being 17.65 carats. 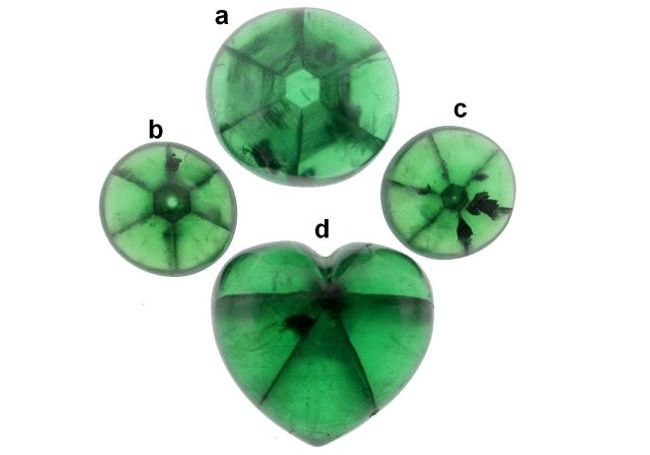 All specimens were cut in cabochon style; three being oval and one heart shaped, and all exhibited clear dark trapiche rays along with an intense green body colour. The cutting of each specimen was such that the core was at the centre. The spot refractive index was measured at 1.57 and specific gravity at 2.69; these values were consistent in all the four specimens; all samples also displayed a strong chromium absorption typical for emeralds. All the four specimens exhibited six similar, black rays but the central core varied: the heart shaped cabochon had a dark green to black core (with immediately emanating intersecting six rays) (figure 1.d), while the cores of oval cabochons consisted of colourless to milky white zones followed by the black spokes (figure 1.a-c). At some angles with in the milky white cores, a strong sheen effect was also observed. On magnification, the hexagonal cores exhibited a tapered appearance, along the ‘c’ crystallographic axis of the specimen i.e. the area of core increased or decreased as the microscope tube was racked up or down. A magnified view of largest oval cabochon (figure 1a) is shown in figure 2; the core of this specimen was narrow relative to the base, but in two cabochons (figure 1b and c) the core was broader at top. Considering the relative sizes and overall tapering effect of the hexagonal cores (figure 1a to d), the four specimens were arranged in order of decreasing core size from top to bottom (figure 3). This is consistent with the claim that the stones were cut from a single crystal. The cabochon shown in figure 1a contained colour zoning detailed in figure 4 under magnification in diffused light. 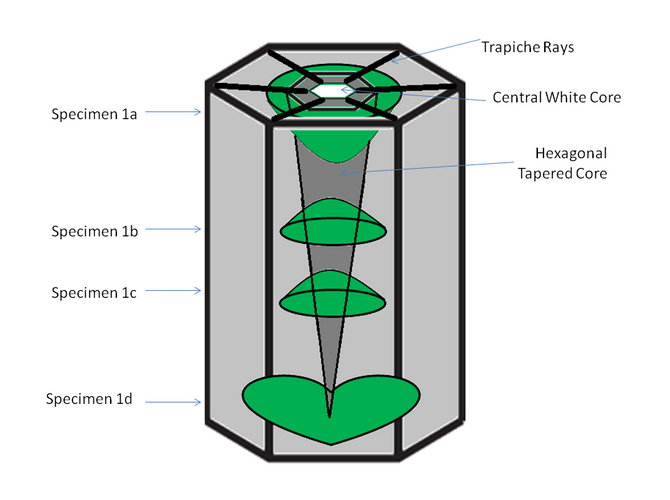 The centre was colourless to milky white followed by green zones and bordered with a black hexagonal outline, the corners of which are the origins of the trapiche rays. Further green colour zoning was present in the sectors between the rays. Many tiny black (crystal) inclusions arranged along the horizontal axis of the specimen form the black rays. Some black impurities were also present in random patches (figures 1a and 4). 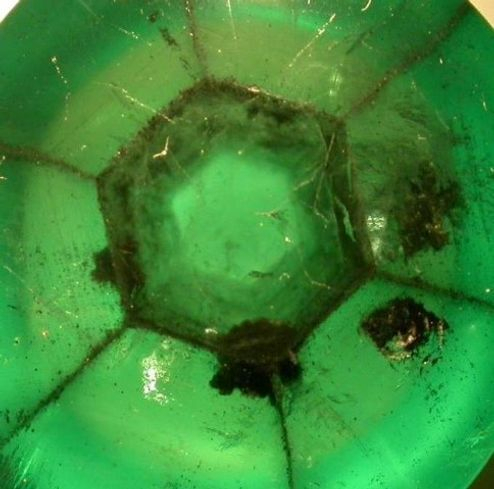 Other inclusions consisted of colourless to milky white crystals, tube-like inclusions parallel to the ‘c’ axis, and jagged 3-phase inclusions typical of Colombian emeralds – the likely source of these trapiche emeralds (Ohnenstetter et al. 1998). The arrangement of the inclusions in such a star pattern suggests that it is primary and not secondary i.e. the inclusions took their positions during the growth and were not introduced after the host had grown (Schmetzer et al., 1996), but the detailed formation mechanism of trapiche is still a question unanswered. However, it is likely to be a result of intergrowth of an emerald crystal with some dark minerals / impurities (commonly carbonaceous matter) oriented along specific horizontal crystallographic axis (Sinkankas, 1989). The trapiche rays in emerald have been reported to be made of various mineral of different origins consisting mainly of albite, beryl; additionally monazite, K-feldspar presumably adularia, epidote, apatite and zircon (Ohnenstetter et al. 1998). Figure 4: Note the zone pattern within the core and the hexagonal colour zoning outside in this largest oval cabochon. Magnified 15x. Photo by C. Golecha. Though the trapiche pattern is generally associated with emeralds, recent years have shown an increase in the number of gem varieties showing this effect. These include rubies, sapphires, morganite, aquamarine, quartz, and tourmaline (Win, 2005). Trapiche stones with a moving star have also been reported. The examination of a suite of these enviable gems cut from a single crystal is certainly a pleasure for a gem lover! Donoghue,M.O., 2006. 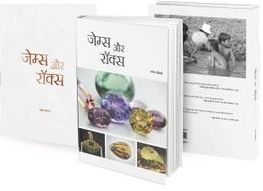 Gems-Their Sources, Descriptions and Identification, sixth edition. Butterworth-Heinnemann, Burlington, USA, 400. Ohnenstetter, D., Giuliani, G. and Bustos, O., (1998). Emeraudes Trapiches Colombiennes. L emeraude. p. 122 Association Francaise de Gemmologie, Paris. Sinkankas, J. 1989.Emerald and Other Beryls, pp. 262-264, Geoscience Press, Prescott, AZ.